In this paper, we trivially extend Tempered (Localized) Ensemble Transform Particle Filter—T(L)ETPF—to account for model error. We examine T(L)ETPF performance for non-additive model error in a low-dimensional and a high-dimensional test problem. The former one is a nonlinear toy model, where uncertain parameters are non-Gaussian distributed but model error is Gaussian distributed. The latter one is a steady-state single-phase Darcy flow model, where uncertain parameters are Gaussian distributed but model error is non-Gaussian distributed. The source of model error in the Darcy flow problem is uncertain boundary conditions. We comapare T(L)ETPF to a Regularized (Localized) Ensemble Kalman Filter—R(L)EnKF. We show that T(L)ETPF outperforms R(L)EnKF for both the low-dimensional and the high-dimensional problem. This holds even when ensemble size of TLETPF is 100 while ensemble size of R(L)EnKF is larger than 6000. As a side note, we show that TLETPF takes less iterations than TETPF, which decreases computational costs; while RLEnKF takes more iterations than REnKF, which incerases computational costs. This is due to an influence of localization on a tempering and a regularizing parameter. Dubinkina, S, & Ruchi, S. (2019). 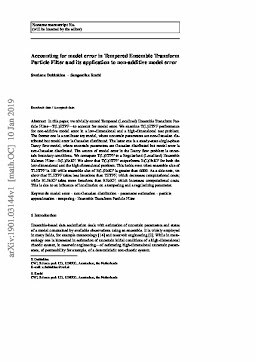 Accounting for model error in Tempered Ensemble Transform Particle Filter and its application to non-additive model error.